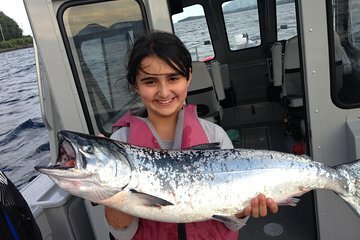 Explorez les eaux profondes au large des côtes de l'Alaska lors d'une charte de pêche personnalisée de Ketchikan. Optez pour le flétan du Pacifique et quatre types de saumon d’Alaska ou optez pour un autre domaine, comme observer la faune ou prendre des photos. Votre capitaine expérimenté pourra vous suggérer des escales et personnaliser l'itinéraire en fonction de vos préférences. De plus, choisissez une sortie de pêche de 4 heures ou de 6 heures en fonction de votre emploi du temps. 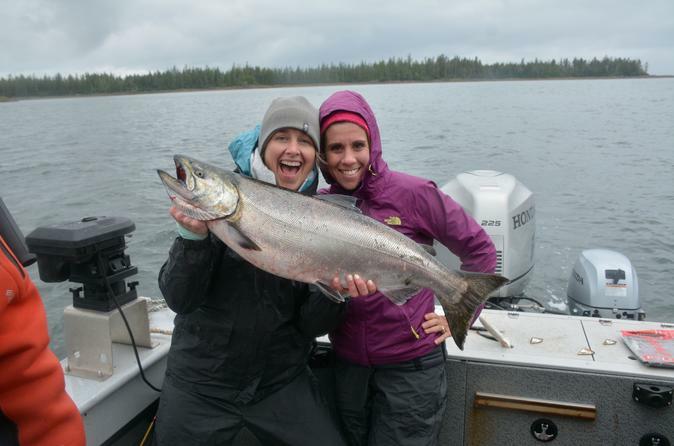 Alaska King Charter booked with Viator exceeded our expectations! The Captain was an expert fisherman. He took our group out about an hour to his favorite spot and made sure we all reeled in some BIG ones! A lot of hands on fun, putting bait on the line, reeling in fish and netting the big ones! The Silver and King Salomon were huge! We even saw a pod of killer whales breaching and playing around our boat as well as a big humpback! This tour was amazing! Best Ever! Worth every penny. William is amazing and hard work. He took two moms and three 10 year old boys out for a day of fishing. We came back to the lower 48 with 24 pounds of Alaskan King Salmon and Halibut! He worked hard to make our day special. If you are looking for a once in a lifetime adventure -- this is a trip that will leave you with lasting adventures on plenty of fish tales!